There's no doubt Ben Pakulski is big. But is he the next big thing? This rising star tells us how he has worked to create a total physique to match his world-class legs. Many in the competitive bodybuilding community view it as a foregone conclusion that Ben "Pak Man" Pakulski will one day stand alone on the stage at the Arnold or the Olympia. It's just a question of when. At age 31, this Canadian colossus possesses the best set of wheels on today's pro bodybuilding circuit, and his overall size and conditioning that make him a legitimate threat in all IFBB pro events. His struggle, since turning pro with a victory at the 2008 IFBB North American Championships, has been to prove once that his upper body is as impressive as his legendary legs. He placed a controversial fourth at the 2012 Arnold Classic. Many people felt he should have landed in second, or even won the event. Six months later, he took 11th at his first Olympia, the buildup to which was portrayed in the well-received recent documentary The Debut. Both of these high-profile events intensified Pakulski's desire to fully realize his pro potential. Certainly, at 5-foot-10 and carrying over 260 pounds of contest-ready beef, he has the size to go toe-to-toe with the biggest and best in his division. He also has the coveted "freak factor" and conditioning on par with anyone else in the world. 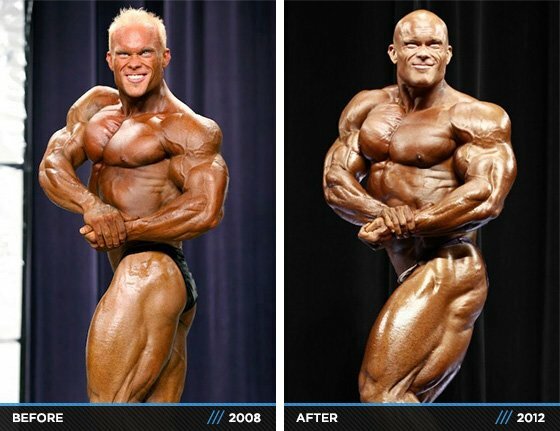 As determined and intense a competitor as can be found in the current pro ranks, Big Ben is a top-tier talent to watch at the 2013 Arnold. In the following interview, Ben outlines the program changes that have placed him on track to challenge for the crown in his third Arnold Classic showing. For the first two years of your pro career you competed just once per year. What was the strategy behind doing this? While I saw myself walking onstage as a pro, I didn't see myself ready to win a show. I'm not the kind of person who is just going to compete to compete. To me it seems silly. I'm not going onstage for the sake of being there and to get a competitor's badge. When I go onstage I expect to be in the top three, or to win. I'm not going to beat my body up dieting, because you are not going to make major progress when you diet. I think it is pointless getting onstage when you are not ready to compete with the best. I qualified for the Olympia in 2009 yet did not do it. What's the point going out there and finishing 15th? I needed to make improvements; I was young, fresh and raw. My goal is never to compete at the Olympia; my goal is to win the Olympia. I'm not just going to jump onstage to say that I did it. 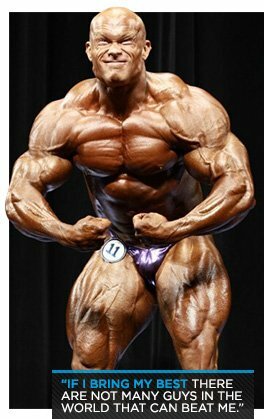 After your strong showing at the 2012 Arnold Classic, plenty of people are saying that you're poised for your first major pro win. Do you agree? I believe so. If I bring my best there are not many guys in the world that can beat me. So I'm doing what I need to do to be at my best, which means working harder than ever. Have you made any changes to the training program you used to prepare for the 2012 Arnold Classic? This year I didn't do any cardio until six weeks out. I usually start dieting at 12 weeks out, yet once I start adding cardio, I'm not able to get my training intensity to the level I feel it should be at. I don't get as strong and I don't work as hard because I'm so depleted from cardio, so this year I allowed my training to peak before I added any cardio. Once my training peaks, I'm burning so many calories and stimulating my metabolism so much that I'm going to burn fat anyway. So I was training twice per day at peak capacity until six weeks out and then just added a little bit of cardio. My body responded extremely well. I still feel mentally good. During other preps I was like a zombie 3-4 weeks out. I have a big structure so I need to come in big. My upper body needs to get substantially bigger to match my lower body so that has been my plan: Stay full, stay strong, keep training hard, and hopefully everything just pulls together during that last week. You're known for your superior leg development. Will your upper body be as impressive onstage at this year's Arnold? Well, that's always the goal. I had a tendency to over-train. I over-trained for the  Olympia to where I couldn't even get a pump in the gym after the show. This year I had to hold back on my training frequency and cardio while maintaining the same intensity. But it's a balancing act; this time I'm doing just enough but not too much. Do you feel that because your leg development is so great, your upper body development gets overlooked? Of course. Some of the top guys in the sport, current and very recently retired, said that with my hips being so little and my quads so flared that it makes my back look narrow from behind. Yet my back looks wider than everybody else onstage. Dennis Wolf is known for having a wide back onstage, but if you compare some of our photos I'm substantially wider than he is. It's a difficult thing. Sometimes I struggle with myself. Should I bring my legs down or continue to train them the way I always have to make them my freaky body part? There is no right or wrong answer until I start winning shows. My way is not to back up on a body part but to train it harder, so that's what I've been doing for my back. It is certainly better than it was last year, and so are my arms. So I guess we'll know in about three weeks' time. 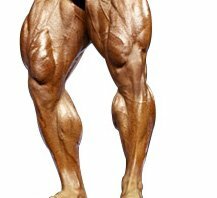 In preparation for this year's Arnold, have you hammered your legs equally as hard as you have done for previous events? To be honest, not really, but it is more of a frequency thing. I've begun training them a little less frequently. So I still train them equally hard, just not as often. What is the strategy behind doing this? Well, as you can imagine, with my leg size and strength there is a lot of energy being expended each time I train them, which causes my nervous system to become exhausted. It can take me up to three days to recover from a leg workout, and that's going to detract from my other training. So the idea behind training them less frequently is to ensure they do not detract from my other body parts. Last year there was a little controversy concerning the comparison between your leg development and that of fellow pro Branch Warren? In the view of many, your legs are superior. Would you concur? Branch's legs are hard, yet there is not a lot of separation. There is no doubting his all-around hardness, though. What will you bring this year that will convince the judges that you are the winner? What will distinguish your physique from that of the next top Arnold Classic contender? Overall size is obviously important: to be onstage with my size, shape and symmetry. And if I hit the same conditioning I usually bring, or slightly better, there is no one at the same level. Who do you see as your major competition at this year's Arnold Classic? Well Dexter is Dexter, and Toney Freeman is looking outstanding. He's a good friend of mine, and I know he's going to bring his A-game because this is a good opportunity for him to win. And, of course, Cedric [McMillan] is seen as one of the frontrunners because he has a beautiful physique. But he's got his gaps as well. And there is Fouad [Abiad] who, from what I have seen, has made great progress. There is a bit of unspoken rivalry between us, as we are the two Canadian guys. What do you expect to weigh onstage? It's hard to say. I sit right now at 296 pounds, and I got my body fat measured at 6.2 percent. So probably I'll be somewhere between 275 and 280 once the water has been lost along with any remaining body fat. It's hard to tell, though. Will you be the biggest guy onstage? Among the many great IFBB pros currently competing, you are one of the bigger fan favorites. Why do you think this is? I guess it's because I'm real and approachable. A lot of bodybuilders tend to be closed off and not as receptive to their fans. I make time for my fans. And also I bring a bit of a freak factor in coming in harder and bigger than most. Plus, my legs. I think people like the freak factor. With the exception of this year's Arnold, do you tend to change your training approach from year to year or do adopt a similar plan each time you compete? Training I tend to change from year to year, but with diet I maintain what works for me. I train my body day to day depending on what I feel my body needs. If a body part is responding well to a movement, I will keep it; if it is not, I will change it. Over the years I've become better attuned to what my body needs. Are there certain movements you keep in your training program regardless? I'm diverse in my exercise selection. I do a lot of different exercises and work my muscles from a lot of different angles, so there are many different movements I keep in there. How do you eat for offseason size versus pre-contest conditioning? It's similar—just different portion sizes. For the most part I eat high protein and a lot of fat in the offseason. I take in carbs when I feel I need them and when I feel that I've earned it, usually when I train hard or post-workout. I take in carbs, but not the massive amounts some bodybuilders do. You want enough calories, not massive amounts of sugars. For me it is a lot of protein and fats with a certain amount of carbohydrates according to what I feel my body needs. So are you an advocate of consuming clean calories as opposed to bulking with whatever you can get your hands on? Don't get me wrong, I like to enjoy my life. I have a family, and sometimes in the offseason I'll eat foods that are not prepared at home. I have no problem doing this in the offseason, but for the most part my diet is healthy. You're sponsored by AllMax Nutrition. How big a factor is supplementation for you? It's huge. I'm a huge believer in supplementation. One of the reasons I signed with AllMax Nutrition is because their supplements are so consistent. There are no bells and whistles and shiny red balls. What you get is good, quality product. I want the best out of my body so will only feed it the best supplements. I only buy the best quality meat and vegetables, so I only consume the best quality supplements. If you were to remove supplements from your training tomorrow, would there be a noticeable difference in your energy levels and physical appearance? Absolutely. I'm a big believer in using supplements for energy and recovery. You were the subject of the documentary The Debut. What was it like for you shooting this movie as you prepared for the biggest contest of your life, the 2012 Mr. Olympia? For me, it was the filming of my life's dream. It was amazing to share with everyone how even a kid who came from a poorly dealt hand, with genetics that are not exceptional, still achieved his goals, and that if you have clarity of purpose and work toward it with relentless desire you will succeed. For me it was great to share that story. It was my dream coming true. It's good to have it to show my children—and myself, when I'm an old man in my rocking chair. It's pretty cool and certainly was a great experience for me. It was nice seeing the bond you have with your father, who was clearly instrumental in helping you to get to where you are today. He really has been. He got me started at my first gym. Obviously every kid wants to impress Dad, so I would bring him in there from time to time and show him how I was working hard and doing good things. He took me to my first Olympia, and now I just want to return the favor this year. I sent him a ticket to the  Olympia; I didn't tell him, I just let him find it in the mail. I'm sure he got a nice surprise: second row tickets to the Olympia to see his son onstage. Thank you for this interview, Ben. Who would you like to thank for helping you to become a top pro contender? The list is so long. I would start with my sponsor, AllMax Nutrition. They have been instrumental over the last few years. Weider has also been instrumental in giving me the exposure I need. Personally, there are so many friends and I wouldn't be anywhere near where I am without them. I've had a training partner since I was 15-years old who has been the greatest training partner I've ever had, Victor W; and also my best friend since school, James Sheehan. These guys instilled success in my mind, knowing I could be anything I wanted. Their passion taught me that mediocrity is not acceptable and that you must push beyond to be the best. No one has ever impacted me the way these two guys have. Unfortunately, the next three biggest influences on my life all three passed away well before their time. Tom Hall was my first influence in bodybuilding and my mentor from 17 years of age. Peter Chiasson was my best friend and mentor who showed me more about exercise and life than any degree or textbook could ever teach me in 100 years. Darren Oliver was a guy who came into my life and believed in me more than I believed in myself. His constant support and brotherhood helped me get to where I am today. I wish I had all three to confide in and lead me every day. Their wisdom will carry me to the end of my life. Do you compete for them as well as for yourself? Yes, every year. They are first on my mind; they were by far the biggest influences on my bodybuilding career. They changed my life. I think I would be a better person if they were here, but they fuel my fire if I'm having a bad day or need a kick in the pants. To buy a copy of The Debut or Ben Pakulski's 21-Days-Out Olympia diet, visit: http://www.benpakulski.com/the-debut-dvd.